Br. Michael J. Meehan, CSV, passed away quietly at the home of his parents in Utica, Illinois, on May 14, 1892 after a long and lingering illness, at the age of 22. He was the first U.S. born Viatorian to pass away. Br. Meehan was the son of William Meehan and Honora Fitzgerald. He was born on September 27, 1870 and entered the novitiate on May 18, 1885. 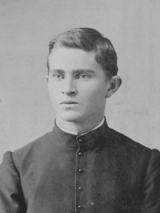 On Oct. 21, 1885 he took the habit and pronounced his first vows on August 27, 1887. He pursued an undergraduate degree in philosophy with great success and was preparing to enter study for the priesthood, all while teaching Latin, Greek and mathematics at St. Viator College in Bourbonnais, Illinois. During the 1890-91 school year, he was advised to rest because of his illness and he reluctantly had to abandon his work and return home. Br. Meehan was devoted to the Viatorian Community, and though he was not yet 22 years of age, he had asked the privilege of pronouncing his perpetual vows at the next annual retreat. The Rev. J.J. Cregan, CSV, assisted by Rev. D. Crow, pastor, and M. Lynch, sang the solemn funeral services May 16 in St. Mary’s Church in his native village. At the request of the family, he was buried in the cemetery there. On the following day, the Very Rev. 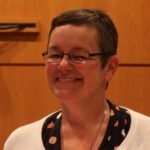 Cyrille Fournier, CSV, provincial, assisted by the Rev. Moses J. Marsiles, CSV, as deacon celebrated a solemn requiem Mass in the St. Viator College chapel. Br. Meehan was not only a model son, but also an exemplary religious, and an honor to his family and his community. May he rest in peace.